SlimBrowser is a tabbed web browser fully loaded with handy features. It includes popup blocker, automatic web-form filler and spell checker. It let you open several sites at once with the support of site groups. It provides one-click access to search engines via pre-defined quick search entries. You can easily define your own quick search entries. It provides one-click access to personal accounts via predefined autologin entries. It supports URL filter and in-page ad filter which blocks annoying advertisements and offensive content effectively. It is able to render RSS new feeds into readable web pages. It support URL alias and built-in commands. It also supports ftp file uploading. The built-in ScriptPad is able to edit JScript / VBScript and HTML files with syntax highlighting. The program interface is fully skinnable and a large collection of skins are available for download. Slim Browser brings you convenient and safe browsing. • Tabbed web browser interface to avoid taskbar clutter. • Built-in Popup Killer suppresses all annoying popup ads while you browse internet. • Built-in web form spell checker. • Universal URL Filter: Block ad banners, flash animations, iframes or any components within any web pages by URL patterns. • ScriptPad: Built-in VBScript/Jscript/HTML/Text editor. View screenshot. • Skinnable frame for the web browser window. • AutoLogin: automatically connect and log into specified internet site with just one click. 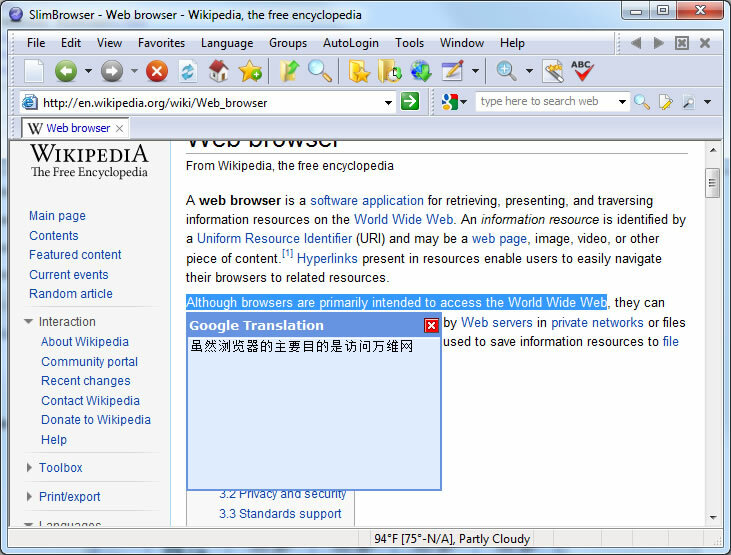 • Seamless integration with internet translation engine and dictionaries. • Site Group: save a collection of internet sites as a group and open all of them in the browser with a single click. • URL Alias: Type short alias instead of full URL to browse frequently visited internet sites. 1. Added support for submitting language files directly from language file manager. 2. Bug fix: position max-min-restore buttons correctly when switching into and out of compact mode. 3. Allow users to drag the mini menu button. 4. Improved address typing suggestion algorithm.